You can set up your email account on Microsoft Outlook Express. To do this, you can either follow the instructions below to run the auto-configuration script which does the process automatically for you (recommended), or you can manually configure the email account (usually for experienced users). You should find that you are in your email accounts management section. If you scroll down, you should find the email account record for the one which you are looking to set up in Microsoft Outlook Express. 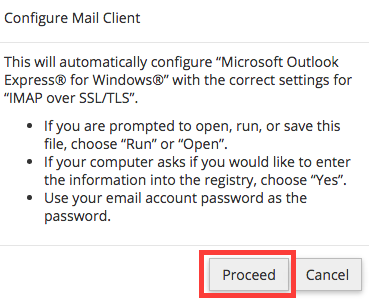 Against that record, you should see an option shown as 'Configure Mail Client' which you need to select. The subsequent page will now provide many options to auto-configure the email account. From the list, locate your option shown as 'Microsoft Outlook Express® for Windows®'. 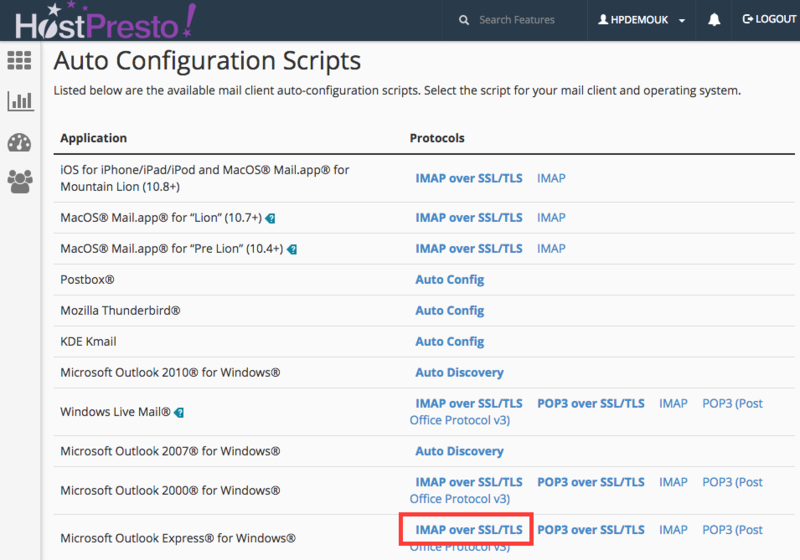 The recommended protocal is 'IMAP over SSL/TLS', as shown below, which you need to select. Once chosen, you will see further instructions on how to complete the auto-configuration option. Choose 'Proceed' as shown. Note that the instructions indicate that you will need to choose 'Run' or 'Open' to complete the auto-configuration. It's also important at this stage that you know what your email account password is as this will be required to finalise the setup. If you are unsure on this is, please see 'How to Change your Email Password'. You should now find that your email account has been auto-configured in Microsoft Outlook Express. To manually configure the email account, the first step is to log into your cPanel account. If you are unsure on how to do this, please view the following help article - 'How to log into cPanel'. Open Microsoft Outlook. From the menu, select 'Tools' followed by 'Accounts'. Go to the 'Mail' tab and from the 'Add' button, select 'Mail'. In the 'Display Name' box, enter your name and select 'Next'. In the 'Email address' box, enter your email address and select 'Next'. My incoming mail server is: Choose your preference. 'IMAP' (recommended) or 'POP3'. 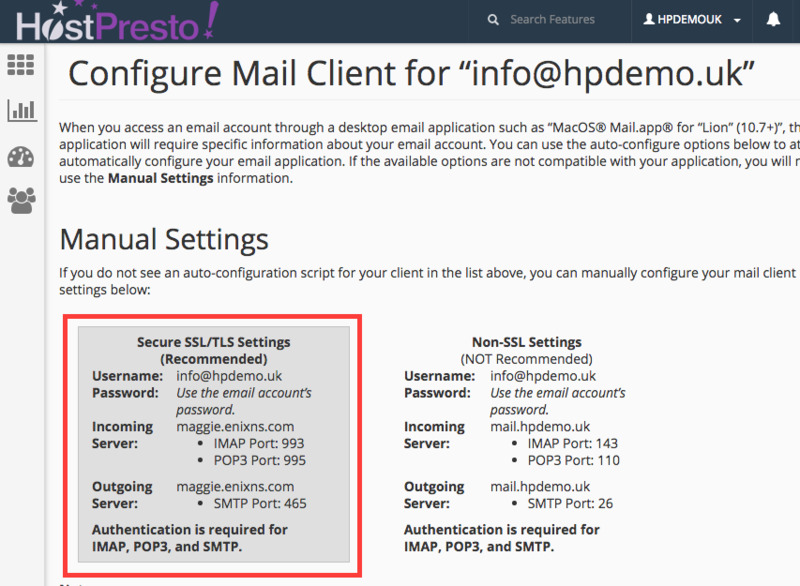 Incoming mail (POP3, IMAP or HTTP) server: Enter the information from your settings. Outgoing mail (SMTP) server: Repeat again the information from your settings. In the 'Account Name' and 'Password' boxes, enter your email address and password followed by 'Next'. On the confirmation page, select 'Finish'. On the 'Mail' tab, select the account that you have just set up followed by 'Properties'. Select 'Servers' tab. Tick the option under 'Outgoing Mail Server' shown as 'My server requires authentication'. Select 'Advanced' tab. Under the 'Server Port Numbers' heading, enter the ports from your manual settings information. If you are setting up the email account with SSL (IMAP settings), tick the respective options. If you would like to keep a copy of email messages stored on your email provider's servers, under the 'Delivery' heading, tick 'Leave a copy of messages on server'. Your email account in Microsoft Outlook Express has now been manually setup. You should now be able to successfully send and receive email.